WASHINGTON – Early this morning, Congress passed a bipartisan budget bill, which includes an agreement to increase domestic spending caps and contains substantial victories for America’s young children from birth through age five. 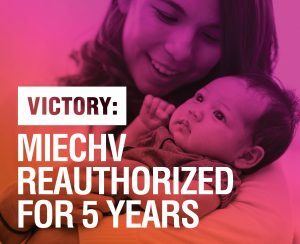 Notably, the Maternal, Infant, and Early Childhood Home Visiting (MIECHV) program, which expired in September of 2017, was reauthorized for five years, alongside other health extenders. This critical program provides funds to states and local grantees for developing and implementing voluntary, evidence-based home visiting programs to support at-risk families. A deal made by Senate Majority Leader Mitch McConnell and Minority Leader Chuck Schumer as part of negotiations on this budget bill also included $5.8 billion in funding over two years for the Child Care and Development Block Grant (CCDBG) program. This would effectively double the program’s discretionary funding and enable important improvements to child care quality standards, which were initially approved by a bipartisan majority of Congress in 2014. These block grants are administered by the Office of Child Care and the Department of Health and Human Services. In late 2016, FFYF published a policy framework recommending federal policymakers increase support for established early childhood education programs. The framework also recommended the establishment of a well-financed continuum of high-quality education and care initiatives from birth through age five, calling on policymakers to reach bipartisan consensus on the budget to secure funding for all early learning and care programs. The programs, in addition to MIECHV and CCDBG, included Early Head Start, Head Start, and Preschool Development Grants. Today’s bipartisan accomplishment lays the groundwork to expand these additional critical early childhood programs. American voters are united in their support for investing in quality early learning and care opportunities. An overwhelming 89 percent of voters support making high-quality education for children from birth to age five, including child care, more affordable for working families. Thanks to the funding priorities established in today’s bipartisan bill, Congress is fulfilling voters’ wishes to provide the nation’s young children a strong start, regardless of socioeconomic background.